The Puplight2 comes with a two piece reflective collar rather than a black one for the standard Puplight. It is made of polycarbonate plastic and nylon. Water Resistant - if it starts to rain or if light gets splashed. 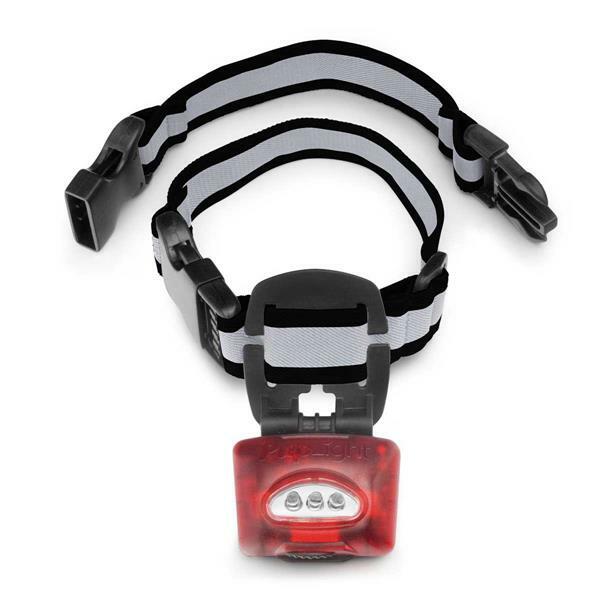 The light comes with an adjustable elastic band worn below existing collar: easily slips over the dog's head or use side release buckles. This keeps the light from moving when leash is pulled to one side. Also there is an extender strap for large dogs. Fits necks 8" to 26". The Puplight has 3 Ultra-Bright White LED's. They illuminate up to 200 feet in front of the Dog and 70 feet to the side. A Dog can be seen coming 3 blacks away and 1.5 blocks from behind Light shines brightly for 150 hours The light uses 3 AAA batteries (not included). Can be shipped USPS.